Welcome to the Australian College of Tai Chi and Qi Gong! Newcomers are encouraged to read through the information below... We hope you will join us at a Saturday practice or take a class. All students - thank you for visiting our web site; we hope you find the details you need today. Tai Chi (Tai Chi Quan) and Qi Gong (Chi Kung) have a very long history in Chinese tradition and culture. Tai Chi and Qi Gong utilise the body’s Energy System for body, mind and spiritual development. Tai Chi exercise is derived from martial arts with a history of over six hundred years. The essence of Tai Chi can be seen in the Ying & Yang symbol which is practiced through the external physical movements and the floating internal energy (Chi). Wu Style Tai Chi is one of the most popular of the traditional forms of Tai Chi. The founder of the Wu Style Tai Chi is the Great Master Wu Jian Quan (1870-1942). This style of Tai Chi can be learned easily by many people, and has been widely accepted as the standard style. 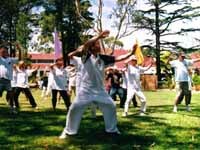 Australian College of Tai Chi and Qi Gong teaches the simplified Wu style Tai Chi, Wu Style Slow and Fast Form, Wu Style Sword and Broadsword (Single & Double), Wu Style Spear and Wu Style Pushing Hands. The techniques are mostly passed down by Grandmaster Ma Yue Liang (1901-1998) and Li Li Qun. Tai Chi Slow Form Slow form is considered the starting point or foundation of the entire Wu style set. It function is to improve general health, fitness, muscle strength and flexibility. It also improves the body circulation, regulation of the nervous system, respiration and reduces stress. This form benefits for both the beginners and advance students. Tai Chi Simplified Form This form is designed for beginner students. The main concept of this form is to learn and control the external balance of the body. Tai Chi Fast Form Wu style Fast Form is the parent of the above slow form. This form Requires experience in slow form. It combines the relaxation and control of slow form with dynamic, powerful movements common to many martial arts. This style is sometimes named "application form". This form is used mainly for self-defense, used for beginners and advance students. Tai Chi Sword Form	Wu style has five straight sword styles. Experience in slow form is required. The sword set can be considered advanced training, for the students that have completed Tai Chi Slow Form. In Tai Chi terminology it seeks to express the spirit of the Phoenix - the Broadsword/Sabre the spirit of the Tiger. Tai Chi Broadsword Both single and double Broadsword forms. Stronger than the other Tai Chi forms. Minimum experience required: slow form. Additional experience in Fast Form and/or Sword helpful. This form is only taught to Advance students and Instructors. Tai Chi Spear 24 Form and 13 Form available. Minimum experience required: slow form. Additional experience in Fast Form and/or Sword helpful. This form is only taught to Advance students and Instructors. Tai Chi Pushing Hands There are thirteen basic manipulations or kinetic movements in the tai chi pushing hand: Pung (warding), Lu (diverting), Ji (pressing), An (pushing), Tsai (plucking), Li (twisting), Zhou (elbowing), Kao (leaning) and the five steps, stepping forward, stepping backwards, turning left, turning right, and central balance. Pushing hands technique is used to: Ting (listen), Zou (leading by walking away), Nien (sticking), Hua (neutralising), Fa (attacking). Two people are needed to practice this technique to improve each-others balance and self-defense. This form is taught to students that have finished level 4 Slow Form and Fast Form. This form is also available to the instructors. Qi Gong has a history of over 2000 years in China and is the practice of internal movements of the body energy (Chi). Simply, Tai Chi uses physical exercise to circulate energy while Qi Gong teaches you how to adjust the mind, the breath and the body posture to stimulate and circulate Chi. Qi Gong Level One Qi - Energy/Life Force. "Gong" - To work at or master something. Qi Gong is primarily a health system based on breath, posture and concentration. Level One teaches the basics of Qi Control, Qi Gong history, Energy Ball Method, Less Heavenly Cycle, Great Heavenly Cycle, four breathing techniques and the Qi Gong principle. Excellent for reducing stress, improving health and preventing illness. Teaches the basics of mental training. Benefiting for the beginner Students. Qi Gong Level Two	"Step Back Qi Gong". One of the 21 forms of Qi Gong officially recognised by the Chinese Government. This medically-focused Qi Gong was developed by Grandmaster Li Li-Qun (father of College principal Sam Li). It combines gentle steps with concentration and specific breathing techniques. Used extensively in Qi Gong and Cancer clinics in China, it has proven itself a very effective health method. This technique involves the well-known Step Back Qi Gong. Previous experience in Level One Qi Gong is essential. Qi Gong Level Three	Advanced Qi Gong techniques: breathing methods, circulation methods, Qi emission and absorption techniques. Qi Gong healing: Qi massage and remote Qi healing for example. Level One & Two Qi Gong is the minimum requirement. Qi Gong Level Four	Advanced Qi Gong technique uses the Open Window Method, combining the human and heavenly energy into one, this is a technique is used to communicate the universal energy. Level Four focuses upon spiritual Qi Gong techniques primarily from the Taoist and Buddha school. E.S.P function discussed and various techniques taught. Experience and understanding in Levels 1-3 required. 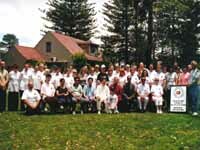 Australian College of Tai Chi and Qi Gong teaches the Qi Gong techniques that were taught and passed on from Grand Master Li Li Qun. Courses generally start at the same time as public school terms start. Beginners can join late, by arrangement with the instructor. Another option is to observe or follow along with the Saturday morning practice until an appropriate course officially starts. All locations are in New South Wales, Australia. We would like to invite you to our regular Saturday morning practice, which is held 8am to 9am every Saturday at the community hall in Gymea.